I am Steve Pollack. In 2007 during a pre-op physical for hernia surgery a chest x-ray indicated something suspicious. Further testing showed that I had male breast cancer. I was shocked and devastated. I had to have a mastectomy and have been cancer free for 9 years. Cancer has changed my life–cancer does that. I began to volunteer to help other cancer patients, as others have helped me. 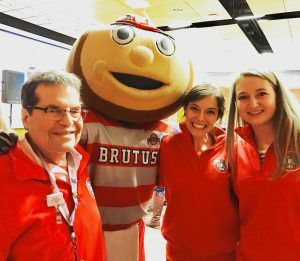 I now work with cancer patients at the James Comprehensive Cancer Center in Columbus, Ohio. My volunteer days are my best days. 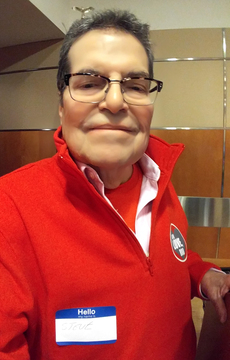 I have created this site to tell my story and offer HOPE to cancer patients, their caregivers and friends. I am not a doctor and do not give or offer any medical advice. All medical questions should be referred to your physician. My 9 year journey through the world of male “Breast Cancer”. My name is Steve Pollack and I am on my 9th year as a survivor of breast cancer. But more than a survivor, I’m a thriver. It’s good to survive. It’s better to THRIVE! Breast Cancer is considered to be mainly a disease for women. But men also get this terrible disease. It effects us all. As men and women we may travel separate paths, but we share the same journey. I would like to take a few moments to share my journey and some of the things I have learned along the way. In 2016 it is estimated that there will be approximately 247,000 new cases of female breast cancer and 2700 cases of male breast cancer. 4500 women and 450 men will die of breast cancer. Men typically do not consider breast cancer as our cancer and rarely perform breast exams. My cancer was discovered during a pre-op physical for a routine surgery. A shadow showed up on an x-ray. This led to a CT scan and a pet scan. They thought maybe I had lung cancer. But the PET scan said no lung cancer and indicated something on my breast—possible breast cancer. A biopsy was recommended. It was at this point that I entered the “woman’s world” of breast cancer. This was starting to get serious. Prior to the biopsy I had a mammogram that was not much fun. To the men who are reading this, when your spouse or significant other comes home and says she’s had a mammogram – You take her out to dinner!! A few days later, on a Saturday I got the phone call. It was from my surgeon and he said “Steve your tests are all back and I am sorry to tell you that you have breast cancer — Invasive Ductal Carcinoma. I was shocked. I was devastated! Up until that point I never thought that I would have breast cancer. Men don’t even think of breast cancer. I cannot describe the feeling. I walk with G-D and I remember saying, G-d I am going to need your help! What are we going to do? I knew I had to start doing something. 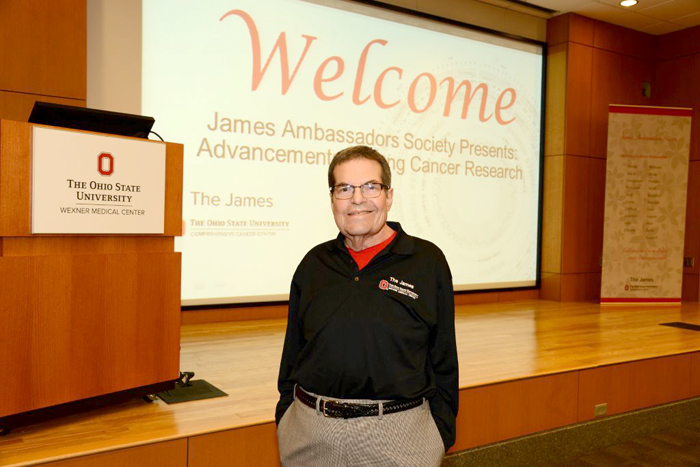 I have been a donor to the James Cancer Hospital for many years to help people who get cancer. And now it was me. I knew it was important to be proactive and I knew that I was going to take the high road to survival. I have learned that SURVIVAL starts from the day of diagnosis. That’s so important for all of us to remember. Monday I spoke to my surgeon. He said, “You come in tomorrow and we’ll fix you up!” Again something positive! December 3rd, surgery. It was cold and snowy and dark. Surgery was scheduled for 6:30 am. I was first up for the day. I wish I could have had some coffee. I was nervous. When I saw my surgeon he had his white coat on and I thought that he looked like a General. Again I felt G-D’s presence with me. I turned it over to G-d and my surgeon. I let it go and relaxed. I remember waking up in recovery. My breast was gone. I was heavily bandaged. I had a drain and even with the pain meds I was sore. I was pretty upset and I can tell you that not only do real men wear pink- but real men cry!! The next day I went home and began to heal. I was treated well during my stay at the James Cancer Hospital. From my surgeon who was like a machine, to the staff and nurses who are Angels. Nurses who are there to take care of you when nothing is going right and you may be at your lowest point. This was very difficult time for me. I began the healing process. It was long for me. I had to wear the drain for a month. I had the help of many people- friends and relatives and all those people at The James. I knew I was going to get better. I had cancer but I was not going to let cancer have me. Cancer was not going to define me. I have had additional surgery since, including a subcutaneous mastectomy. It was not malignant. I have become an advocate for cancer awareness and cancer prevention. Not just male Breast Cancer, but all cancers. All cancers are ugly. During our lives one-half of all men and one-third of all women will get some form of cancer. Cancer is not about someone else. Cancer is about you. Cancer is about me. Cancer is about your relatives and friends. Cancer is about all of us. In January 2010 I knew it was time to help others as others had helped me. I realized that for me cancer carries a responsibility – The responsibility to fight back – and the obligation to give back. 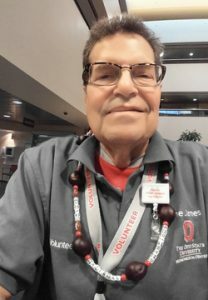 I started volunteering at the James, working one day a week with Chemo patients at the Breast Center and one day a week at the Hospital’s clinics, working directly with cancer patients. I worked with radiation patients. My volunteer days are the best days of my week. A conversation with a patient can give them hope and help them heal. I feel that volunteering to help others is one of the best things you can do. As you help others you help yourself. Sometimes the most powerful medicine we have to give is the medicine of our friendship. July 2014 the possibility of recurrence of cancer reared is ugly head. Based on a CT scan, a PET scan and some other tests there was a good possibility that cancer had returned. It is a survivor’s greatest fear. And one that is always in the back of our minds. Sometimes closer to the front of our minds. I spent a week in the James Hospital. I had many tests with teams of doctors. 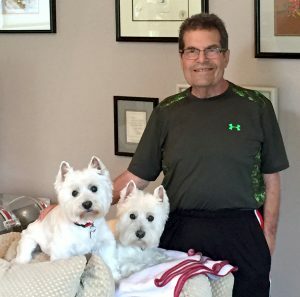 After a PET scan showed some signs of possible malignancy, I had thoracic surgery. And finally two weeks after surgery, the biopsy proved to be negative for cancer. What a relief that was. The most important lesson for me is not to get my exercise by jumping to conclusions. My oncologist said to me as I was going through the waiting period to find out if I had more cancer, “Steve, I’ve been your doctor for 6 years. We will find out what it is and then we will deal with it.” I began to calm down when she said that. I had another PET scan in October. There was no additional cancer. Cancer has changed my life. Cancer does that. I have always lived a good life. I call it a life in living color. Since Cancer I am now brought to you in High Definition. Every day is a special day because I am alive. You are a part of that process. I have learned so much about the beauty of life through the ugliness of cancer. As Survivors and Thrivers we have traveled different paths but share the same journey. As we continue our journey always keep a sense of humor. In closing I would like to read a few lines from a play that I was in with other cancer thrivers and OSU theater students. We wrote our parts and practiced for months.